The pouring rain...sounds beautiful in the silence as I work by window light. The temperature is a few degrees above freezing or there would be even more trouble!! Silence? At a factory? Yep. The power's out. Generator engine is broken and they race in this icy weather to fix. Can't imagine my hands in icy cold wet metal right now. Brrrrrrrrr! They keep asking if I'm OK. I'm bundled up like nanook with all my extra extra layers on. I'm fine. I told them to just take their time and do it right. The poor generator hasn't ever seen such cold!!! Occasionally we here some fire crackers from a nearby factory, likely set off by workers to kill their bordom & lighten their spirits as the factories have closed for Chinese New Year and they cannot get home. Farms covered in snow as farmers race to save their harvests. They talk of the pending food shortage on the news. Roads impassable due to snow and ice. Some regions haven't seen snow in 50 years...some as much as 70, so they certainly don't have snow plows or salt & sand spreaders. People are stuck. They say half a million homes have collasped due to the weight of feet of snow and ice. People have no heat in the homes that survive. Those still waiting in Guan Zhou -- hundreds of thousands and growing -- I worry there will be a riot when the trains start to run. The government has announced that all tickets through February 6 will be refunded and invalid for travel. That said -- the people wait anyway - cold - hungry. Many had already spent all of their money on food the days they waited prior to the announcement. Food venders actively price-gouging. So when the trains run...who'll get aboard? Those with a ticket or those who have been waiting a week-plus by then in the bitter cold, hungry and angry?? And to think I almost stopped at a different factory more north first on this trip!! I'd have been stuck there still!!! Here I sit, bundled up... Happily hand sewing samples by window light. I could SO be in a worse place than this!! CAN'T WE MOVE CNY? JUST THIS ONCE? I know --- asking to move CNY is like asking to move Christmas and New Years Eave all at once. Yep - I'm still in China and it's still really cold. It hit a whopping 44F (7C) today -- which isn't so cold you may think - but when you're in cement buildings, a warm up to 44F doesn't translate into the buildings. This weather situation is ruining Chinese New Year for people. Trains are still at a standstill. As of yesterday 150,000 people were sleeping in the Guang Zhou train station hopeful and awaiting trains. Ice and snow has blanketed areas just north of where I sit, and roads have been at a standstill for 3-6 days now. Fu just came into the office (after having said goodnight for the day) and told us the government has cancelled all home-going (northern bound) trains through February 6th. All this after having to telephone the train company exactly 10 days prior to your departure (no more, no less)-- hoping that your call goes through and hoping you get a ticket before they sell out -- followed by getting yourself to special pick-up tickets building (that isn't at the train station or near good public transport) within 24hrs or you loose it. This means 600,000 people will not be able to go home for Chinese New Year (CNY.) Figuring it can take 4 days journey each way --- most factories & businesses reopen the 15th. There just isn't time now. Fu herself was making her first trip home for CNY to see her daughters. CNY is the only time many people go home to see their families each year. Since it's customary in many parts of China to have the Grandparents raise the grandchildren while the childrens parents go find good work and send money home, this is the only time parents often see their children all year long. At least they are refunding the cost of the train tickets! A rarity indeed!If you're interested in photos of this all, BBC had a story on it this morning that I'm sure you could find at www.bbc.com . Especially now with the trains being cancelled rather than "delayed." Tony (works with me at the factory) just told me that it's so cold in China right now that (local) trains have broken down due to the cold. 90,000 people are stranded on trains & the train company has been trying to put some diesel engines on the tracks to fetch the dead trains and move the people along. Most trains are electric and don't handle this cold well at ALL! Normally this cold wouldn't be QUITE so bothersome, but trains are filled to their roofs with people heading the many days journey home for Chinese New Year!! Fu, the woman who cooks for us at the factory, has friends who decided to drive the 4 days journey home. They have been stuck...stranded in the mountains... on the highway for 3 days now due to the broken down cars and accidents. It's now 42F (6C) at 8:30pm expected to head near to zero tonight. Last night the hotel turned on the heat!! AMEN!!! Of course, extra cold, like extra heat = more electricty needed...so the local gov't is putting through rolling "semi-scheduled" brown & blackouts. Which means everyone needs to have their generators cranked up and ready!! My hotel advised us all that there would be low power for an hour yesterday as their generator would be in place rather than gov't supplied electricity. I missed the fun as I was at dinner. All that said, everyone (myself included) is in remarkabley good spirits as they next few days will bring the start of Chinese New Year celebrations! I see hot tea, hot soup and hot dim sum in my direct future!! Dinner time!! * Packed and ready to go? - Check! Where to this time? My 63rd trip to China, of course! 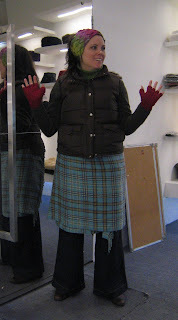 It's time to start designing my next collection for... Spring 2009! Yes - the fashion buisness works this far (sometime further) in advance! January is a rough check writing month for me... 2007 has just ended, I've launched my final collection for 2008 and started work on 2009! I can't tell you how oten I catch myself just in time to write the proper year on a check! The flights here iat Newark are seemingly a mess today -- lit up with delays. My flight is delayed a mere 1.5 hours thus far. Mild compared to those around me that are crying "4 hours!" I've known this was likely since they called me at 8:15 this morning, so I've got a slice of pizza and my knitting at hand. Time to practice a bit of double knitting. I've signed-up for the 2 session Double Knitting Two course at Knitty City (Feb 10 & Mar 9.) I am SHOCKED that I'll be in town BOTH days and able to take a course that is more than 1 day long!! Unbelievable, I know! The flight was thankfully uneventful after finally getting on the correct plane. In fact, we arrived in Barcelona 30 minutes earlier than scheduled. Got the luggage and dashed to the hotel. The BEST part of the flight? Seeing the SUNRISE over Spain. The hotel is set along the Passeig de Gràcia, nestled in amoungst some of Antoni Gaudi's famous fantastical creations. To our right we walked to see Casa Amatller (#41 - shown right) and Casa Batlló (#43). Unfortunately the latter is tucked behind covered scaffolding as they clean it. Casa Amatller was amazing. Every place I looked I saw something new. The bits I saw of Casa Amatller were also lovely. I bought a postcard of them side-by-side. Really cool! Later today or early tomorrow we'll turn left from the hotel to see Casa Milà, Gaudi's famous apartment complex. Said to be the most famous apartment complex within all of Spain. From here we continued down the Passeig de Gràcia and into Barri Gòtic (Gothic Quarter). Barcelona has such grand boulevards, that when wandering into the Barri Gòtic from the Passeig de Gràcia, the Barri Gòtic feels even smaller. Even when it's loaded with bustling people, it feels more intimate. Our first stop in Barri Gòtic was to see the Cathedral de Barcelona. Located along the Placa Nova, it is built in the Catalonian Gothic architecture style and it is BEAUTIFUL!! The labyrinth of tiny streets are lined with small shops selling everything from dry-wall supplies or perfume, to wigs or chocolates. We walked around looking at the architecturebefore continuing on to the Picasso Museum. But...all Picasso exhibits were closed until Tuesday (we leave Monday.) A few lovely Gaudi post cards were picked up and we continued on through the Barri Gòtic. Yes, we couldn't pass up picking up some chocolates from ------- as gifts. I got some Costa Rican coffee beans dipped in chocolate and rolled in cocoa powder -- you know, Jet-lag relief!! After popping into a Barcelona Information center to find out WHERE the yarn shop with my 5pm meet-up was -- I had a partial address but no one knew where it was -- we found out it was a few minutes from where we stood! So, to make it easier later, we walked on over! And next door, we ran into Jennifer and Miguel (and their beautiful daughter) leaving the shop for lunch. I like that all shops close for lunch. Having worked enough retail in my time, it's such a civilized concept!! I said hello and waited for the gate to close so I could take my own photo of it and hopped a cab back to the hotel for an hours nap. I'll leave it here for now...more to come!! 9, 10 [walking], 16... Wait... 9, 10, 16? I think - do I not have a seat? I went back to the flight attendant who tells asks me what I need. "A seat", I reply. I was on the wrong flight. I'm to going to London. I walk off the plane as my boss is about to do the same thing. Yep-those checker-inners are REALLY careful! I'm on the right one now. 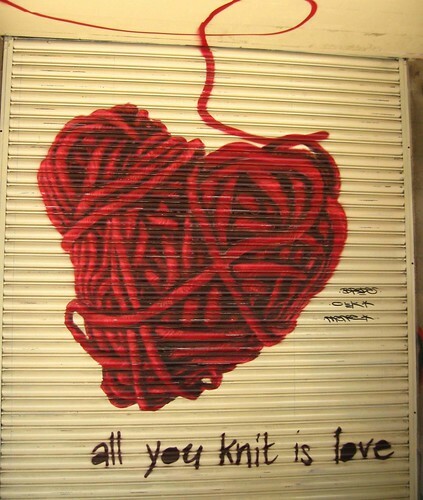 Barcelona Kniteratti - Here I come!!! Yeah!!!! Something fun to look forward to on my red-eye arrival! Phew. Now, what project am I going to pack? buckle in - here goes!!! Last Sunday I took a double knitting class at Knitty City here in NYC. I've been trying to get my hands on a few double knitting books (all out of print) to no aval. When a class was offered i jumped on it - I was the first to sign up in fact! First we did a two color long tail cast on (upper left.) Once done with the cast-on (right), we began to learn how to double knit. It's a slow process, taking two rows of knitting to actually produce one single row. It's also reccomended that you purposefully twist your stitches when double knitting, which for me meant throwing the yarn opposite as I usually would. This also slowed me down a little. The photo at right here shows what looks like 2 rows finished -- except it took you 4 rows to achieve it. I raced through, slightly distracted (which means frogging) by some of the conversations at the table, and finished my square by classes end so I could learn how to Cast-off!! Finished Cast-Off shown at left. I REALLY like the technical easpects of this type of knitting. I wish I could take two weeks off now and get down on paper the designs in my head. It's a very mathmatical sort of knitting. It makes "sense" on a technical level, but at times you just have to trust that what you're doing will work. Other Knitting FO's - Holiday fiesta!!! Fingerless gloves for everyone...or at least the adults!! Patterns in order - Left to Right: Free patterns are linked. Dashing in Cascade 220 and Dashing in Filatura Di Crosa 501. A Extra-long Froth Scarf (Rowan pattern) and 2 slightly adjusted Quaint Quants (I changed the end of the pattern) for girlfriends too! Oh - And I'm off to Barcelona, Spain on Friday for a quick work weekend. Home again Monday. But no worries, I'll be dashing to China the following week. They've let e know that there are new dishes (food) in my future!! YUM!